During a press conference in Chile Monday, President Obama took new questions on the military action in Libya, saying that while it has always been U.S. policy that Gadhafi “needs to go,” U.S. military action is limited to the U.N. mandate. In an interview with the NewsHour’s Dan Sagalyn, retired Air Force Maj. Gen. Dutch Remkes, said he believed the first two nights of the operation in Libya had gone “very well” in efforts to keep Gadhafi’s air force out of the sky and helped protect Libyan civilians. Remkes said the international coalition will want to ensure that that Gadhafi’s command and control operations are taken out, in order to prevent communications with his forces battling rebels in Eastern Libya. Regarding whether the U.S. could really relinquish command of the operation to allies in the near future, Remkes said his experience with the British and French military leads him to believe that they are very capable of taking control. Rather than the operation being run by committee, he foresees one nation taking the lead. The next few days of the operation will likely be a “fluid situation,” Remkes said, as the world awaits the next moves by the rebels and Gadhafi. The New York Times’ Lede blog has collected videos posted to YouTube that claim to show the aftermath of fighting in Misrata. Updated 2:15 p.m. ET with video | The military coalition imposing the no-fly zone in Libya flew 70 to 80 sorties Monday, with non-U.S. forces flying more than half of them, U.S. Gen. Carter F. Ham, the head of U.S. Africa Command, told reporters in an operational briefing. Ham also said that U.S. and European forces are not aiming to “completely destroy” Gadhafi’s military, but rather to target those defying a U.N. resolution. In other developments, the U.N. Security Council will meet privately at 3 p.m. ET Monday to discuss Libya’s accusations about the international military intervention. 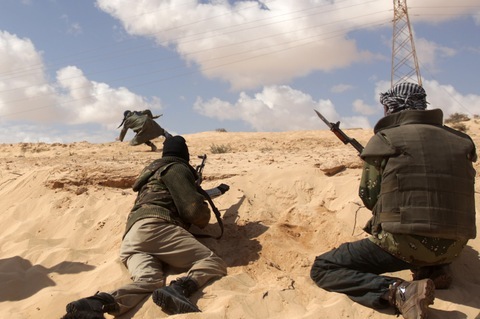 A barrage of cruise missile and air strikes have targeted Libyan air defenses and Gadhafi ground troops pressing in on areas held by rebel fighters. Military operations began Saturday to enforce a U.N.-backed no-fly zone enacted in response to Gadhafi’s attacks on civilians protesting his rule. “We judge these strikes to have been very effective in degrading the regime’s air defense capability, to include their ability to launch many of their SA-5s — their long range missiles — their SA-3s and SA-2s,” Navy Vice Adm. William E. Gortney told reporters during a Pentagon news conference. A cruise missile also blasted a building in Gadhafi’s residential compound Sunday, near his iconic tent. Gadhafi’s location is not known, and no casualties have been reported from the explosion. French presidential adviser Henri Guaino told reporters that the allied efforts could last “awhile yet,” — seeming to to reflect Gadhafi’s promise Sunday of a “long war” with his adversaries. France was among the first to launch military jets in the Libyan intervention. Late Sunday, however, NATO’s top decision-making body failed to agree on a plan to enforce the no-fly zone over Libya, although it did approve a military plan to implement a U.N. arms embargo, the AP reported. Meanwhile, four New York Times journalists who have been held in Libya have been released to Turkey’s ambassador in Tripoli. The journalists are reporter Anthony Shadid; photographers Tyler Hicks and Lynsey Addario; and a reporter and videographer, Stephen Farrell. Track all of our World coverage and follow us on Twitter.